Photograph of sculptured panels in the cave temple of Elephanta in Maharashtra, taken by D.H. Sykes around 1871 in James Burgess' illustrated book 'The Rock-Temples of Elephanta or Gharapuri'. 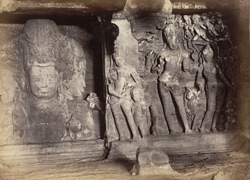 This view shows the sculpture panels that are situated on the south wall of the great Shiva Temple of Elephanta, excavated in the 6th century, Kalachuri period. The triple-headed bust or Trimurti represents Shiva. The left profile expresses the god's feminine and peaceful aspect which contrast with the fierce and masculine right profile. The majestic central face is calm and detached. The three faces symbolise the nature of the Divine, which combines and transcends all opposites. In the panel to the left of this sculpture Shiva assists the descent of the goddess Ganga, observed by his consort Parvati, in the presence of the gods Vishnu, Indra and Brahma.